Where to start? Where did January go? Half of February? I'm still writing 2009 on my checks. 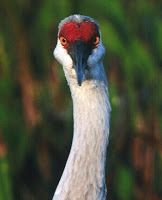 I missed wishing everybody a Happy Valentine's Day and displaying my favorite Valentine photo by Jim Angy. The Saturday of the Festival, we picked up Margie Mitchell in Cocoa Beach and made a quick trip to Canaveral Lock and Avocet Lagoon prior to heading to Titusville in time for Vickie to attend her Kingfisher workshop. The Lock had a wonderful gathering of Brown Pelicans and lots of snook. I was born and raised in South Dakota, where the only fish I ate were trout, and that was in July, so I'm not a fish expert by any means, but Margie tells us that snook is wonderful eating. The catch limit on snook is limited, and unfortunately, we lost thousands of snook during the cold stun event. Avocet Lagoon had too much water and too few birds, but it appears that the overlook tower is going to become a reality at some point. The Birding and Wildlife Festival gets bigger every year. Friend David McRee blogged professionally for the Festival this year, and there's a Reference Link to his excellent wrapup post. We didn't see the Raptor show, but one end of the exhibit area was devoted to the Raptor Exhibit. These were all beautiful birds, but the Golden Eagle was, in the old-fashioned usage of the term, awesome! Margie snapped this photo of him, but you had to be there to really appreciate this beautiful creature. Matt and I attended the Sea Turtle Preservation Society meeting that focused on the cold stun event - the FWC folks are still crunching the numbers, but nearly 5,000 sea turtles were rescued during the event, with about half of those in Brevard County. The mortality rate was about 20%, with many of those washing in dead. The meeting was excellent, with folks sharing their personal rescue experiences. Matt videoed it, and as soon as we get stuff processed, we'll put up some clips. I hope the segment about how to get a 300 pound sea turtle out of the water turns out - necessity is the mother of invention, for sure! Wow you have been busy, no wonder you have not posted. 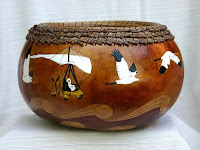 I love the Valentine's Day bird and the gourd bowl is absolutely stunning. Thank you, Marge! I'm still catching up too--lots of great experiences and photos to write about. Thank you again for a wonderful visit.